Prime Minister Tony Abbott and Chief of Defence Force Air Chief Marshal Mark Binskin have announced the commitment of ADF assets to an international coalition to fight the Islamic State forces in Iraq. Speaking to media in Canberra on September 14, the Prime Minister said an official request to join the coalition had been made by the US on September 13, and that government’s National Security Committee had agreed to support the effort. The ADF will commit up to eight F/A-18F Super Hornets from the Amberley-based 1SQN, an E-7A Wedgetail AEW&C aircraft from 2SQN at Williamtown, and a KC-30A air-to-air refuelling tanker from Amberley’s 33SQN, along with an element of about 200 Army special forces soldiers to provide training to anti-IS forces. The Australian forces will be based at the Al Minhad Air Base in the UAE, from which Super Hornet air strikes, and Wedgetail and KC-30 missions could be launched. Al Minhad is some 1,500 kilometres south-east of Baghdad. With most of the operations against IS expected to be conducted taking place north and west of the Iraqi capital, if they are committed to operations missions of five or more hours for the Super Hornet crews will be common. The F/A-18F Super Hornet achieved full operational capability with the RAAF in December 2012 after being acquired in 2010 as a bridging capability between the retirement of the F-111C and the service entry of the F-35A JSF. The aircraft are common to the US Navy Block II F/A-18Fs complete with the APG-79 AESA radar, ATFLIR targeting pods, advanced crew cockpit, ALR-67(V)3 radar warning receiver, and a full array of advanced precision weapons. Meanwhile, the Wedgetail will likely be employed in a command and control role for which it is ideally suited, while its considerable electronic intelligence capability will likely also be brought to bear. And despite advances in the certification effort of its Advanced Refuelling Boom System (ARBS) in recent months, the KC-30 will remain limited to being able to refuel UK and US Navy-style probe equipped aircraft including the Super Hornets with its wing-mounted hose and drogue system, as the improvements to the boom are not expected to be declared operational until 2015. No further information about a possible deployment date or any pre-deployment work-up or exercises has been provided. At last the RAAF capabilities in Super Hornets are being put to use. The RAAF has my support stay safe out there brothers and sisters your are the best air force in the world, make us proud. good luck guys, make us proud as i know oyu will. Go the RAAF! no Legacy Hornets as Backup? clearly they need the Supers modern abilities & US systems interoperability, not to mention range. Wonder if they will operate alongside UAE Block 60 F16s with APG-80 Radar. NZ Govt take note..
Paul I think you are right. Secondary to that they probably want to conserve air frame hours on the legacy hornets as they are already in service longer than planned due to the F-35 delays. NZ doesn’t want or really need air combat capability as per my comments on a previous article. I don’t know why people commenting on Australian aviation articles are so obsessed with NZ’s lack of air combat capability. Oh yes….Forgot my manners. Good luck to our guys and girls heading to the middle east. Make us proud and stay safe. To our fighting men and women be safe, we’re proud of you. Be interesting to see the results of the E-7’s combat debute, after multiple red flags its time for real thing. While I wish everyone every single crew member a safe return home and don’t contest the argument that our presence is indeed warranted, isn’t the use of a very high cost (acquire/maintain/operate) platform like the Super Hornet against, from what the TV footage tends to show, ‘soft skinned’ targets like Hilux utes full of people a significant overkill and poor use of a capital asset and very expensive ordnance? Whilst obviously not privy to the Defence intel on the potential areas of operations, I would imagine the air environment would be relatively benign from an EW aspect and the trend is now to launch SOWs or PGMs from a distance at higher altitudes rather than than go in at low level where MANPADS and similar light weapons can be encountered. I accept that there has been a lot of ‘friendly’ weaponry captured but it would appear that most of that is small arms and light armour, not significant ground to air weaponry. The Super Hornet weapon system was designed, and thus costs the taxpayer top $$ accordingly accordingly, to go into, or defend, highly hostile areas to engage high value, high threat, possibly hardened targets and/or a technically sophisticated enemy. This particular event seems to be even further away from those we recently engaged in but without offensive air assets at the time. My armchair observations of recent conflicts indicates small, light, highly mobile and scattered targets where long loiter times and multiple platforms are needed. Our current air asset inventory seems to have a very, very wide gap for the direct application of firepower for this sort of scenario; at one end we have the Tiger ARH, next port of call is the Super Hornet (eventually JSF). Maybe this is something the new Defence White Paper should be looking at. I second all the goodwill. Let’s give our Super Hornets some operational experience, and hit IS hard! I think the Super Hornet is the right aircraft for this deployment. I think it best to have overkill to keep our people safe. I have no doubt that we will see the service excellence from our men and women. I thank them for their professionalism and dedication to our country. May all return safe to their families with recognition by the community of a job well done. Totally agree with Steve regarding over techy aircraft, especially if the future JSF spends most of its time in the hanger. Oh dear Stewart, I hate to be a harbinger of bad tidings, but what attack platform do you suggest we use; maybe David Lowey could loan us a few Spitfires, or a Canberra, or maybe a Sabre, or do you think our Hawk trainers would do the trick? To be realistic, we have the best, so use the best!!! Our Air Crew deserve the best and safest attack weapon in our arsenal! Good hunting Guys and Girls, and safe return. How about using the Textron Scorpion. If we still had the Commonwealth Aircraft Corporation we could have reverse engineered the F111. I hope the Guys and Girls of the RAAF (and ADF generally) have a very successful, and more importantly, a very safe deployment. You always hope that in conflicts, or the beginning of conflicts, that cool heads prevail, but unfortunately when dealing with ‘crazies’ such as ISIS/ISIL that is never going to happen, ‘hope for the best, plan for the worst’. I think it is a very smart move to deploy the Super Hornets, completely compatible with the USN’s Super Hornets, same radar, same sensors, same weapons systems, logistics, etc. In years to come this deployment will probably be looked back upon as a ‘model’ for future Coalition operations (especially where the USA and Australia’s involvement is concerned). Going into future Coalition operations where the majority of the RAAF’s frontline equipment is ‘off the shelf’/FMS equipment, no major ‘special’ Australianised modifications, straight out of the box, is going to be significant, very significant. Aircraft such as the Super Hornets, Growlers, F-35A’s, P-8A’s, Triton, C-17, MH-60R’s, CH-47F’s, etc, etc, all being able to operate seamlessly, same aircraft, same systems, same weapons and same logistics. Anyway, lets hope that the deployment will be short, swift and successful! At least this government is willing to use the F-18’s. Hawke stated we couldn’t afford to lose an RF-111 in 1991. Be safe guys and girls. Give em he’ll. John N there is only one problem with your view on having off the shelf equipment seamlessly integrate with others using the same – our service men and women will operate it far better. Yes, agree, well educated quality people with quality training is a ‘quality’ all on it’s own, yes there is no doubt about that and they will get the best out of whatever they are operating. But the point I was making was more about what should (potentially), be the ability to seamlessly integrate with Coalition partners (especially the US) in future operations, the ability to share pooled logistics, pooled weapons, etc, will no doubt be a huge advantage. Great news. Send the iS back to Hell !! And come home safe guys and girls. Your training and abilities are second to none. We just need a larger combat force in our Air Force in this increasingly destabilised world. Assuming the navy receive 16 f-35Bs (including aircraft for training) to operate from the LHDs (an outcome I believe has a high probability of occurring) that will leave 12 f-35As for the RAAF from the residual 28 F-35s still to be approved for purchase. This number is to little for an additional squadron. I think the 36 Super Hornets/Growlers will be operating (with upgrades to the Advanced model) beyond 2030 as their full capability becomes apparant. 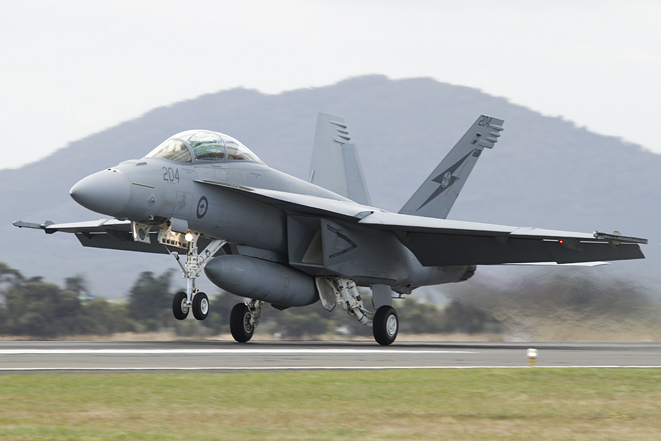 I would hope we purchase an additional newly raised squadron of Super Hornets (Advanced model) of 20 aircraft (some for training) and base them at RAAF Pearce with ongoing deployments of 3-4 aircraft to RAAF Learmonth or RAAF Curtin in NW Western Australia. We already base 76 squadron with Hawk trainers (one flight being an operational flight for ground support of the Army) at Pearce. I would also hope we continue with the purchase of an 28 additional F-35As for the RAAF to equip an additional newly raised squadron (not to replace the 24 super hornets currently at RAAF Amberley) and base this new squadron at RAAF Tindal with the current 75 squadron which will also be newly equipped with F-35As. It has already been rumoured the a government is going to purchase an additional 2 KC-30 MRRTs and an additional 2 C-17s. These (and more?) would be required to support the 2 new additional RAAF squadrons. I believe this proposed fast jet combat force of 100 F-35As and 56 Super Hornets/Growlers (along with the navy’s probable 16 F-35Bs) is really a force Australia requires in a fast destabilising world. We are no longer a small nation. We are one of the largest economies in the world. Our population wil reach 30 million ( from the present 24 million) some time over the next 15 years. We can afford this and we must be able to protect our national assets and national interests. Have to agree with all the good wishes for a successful mission and safe return to all the RAAFies & Army guys & girls. Are you serious? 172 combat aircraft? F-35As, F-35Bs, Advanced Super Hornets, Growlers, where does the money and manpower come from for an almost 60% increase in the fast jet combat fleet? What other much needed capability in the ADF would you like to see disappear to pay for such an increase? Even if the Government manages to get Defence spending to 2% of GDP within 10 years (and importantly stay at 2%), there are still questions over how all of the projects that are currently on the defence ‘shopping list’ are going to be funded anyway. In an era where most of the world’s air forces are shrinking, the RAAF on the other hand will have increased to 108 combat aircraft by the mid 2020’s, I think the RAAF has done pretty well by international standards and not just in the increased number of combat aircraft, but also in the high quality and capabilities of the aircraft that will be in service too. As far as the Advanced Super Hornet is concerned, it’s only a paper aircraft, there are no orders, and more than likely the Super Hornet assembly line will be a thing of the past in a couple of years from now. That’s not to say that some ‘features’ of the ASH may end up in the Super Hornet fleet, but for that to happen the USN would have to want to invest in those features as an upgrade path for their Super Hornet fleet, then, and only then, might we see some of those things (such as conformal tanks for example), end up in RAAF service. I do agree that I would like to see the F-35A fleet reach 100 (when the Super Hornets retire), and maybe ‘if’ the LHD’s can be equipped with F-35B’s (without compromising their primary amphibious role), that the F-35B’s be a ‘separate’ procurement, but I really can’t see that happening anyway, as I said above, something always has to be ‘sacrificed’ because the defence ‘pie’ can only be sliced up so many ways. Just a point… don’t forget the possibility of one-off, additional funding (think $6 billion over 10 years for the Super Hornet fleet provided by the Howard government) – although I do realise this was when the budget was in far better shape (hopefully Abbott and Hockey can get this under control and are re-elected before the overspending cycle happens all over again). Yes I am serious. The fed govt is extremely worried re: China’s growing militaristic behaviour and continuing/expanding efforts to destabilise Southeast and northeast Asia. These are our major trading routes/nations. I believe the 16 F-35Bs for the LHDs is already a done deal. The new defence white paper is already examining the fact the target of spending 2% of GDP on defence is insufficient to protect Australia’s national interests and security. Defence spending in the current budget is 1.8% of GDP. I believe the new defence white paper process is already examining how far above 2% of GDP defence spending will need to rise to cover all the capabilities and equipment quantities the ADF requires. The new subs (8 to 12 in number) will not be designed/built in Australia resulting in a saving in the $tens of billions. The 2 new navy replenishment ships will be built overseas to proven designs resulting in more savings in the $hundreds of millions. The new navy frigates will most likely utilise the AWD hull resulting in significant savings . The conversion of 6 squadron from a training squadron to an operational squadron to operate the Growlers is an indication of the coming expansion of the RAAF over the next 10-15 years. I take your point on the Advanced Super Hornets, but I believe the USN will at the very least incorporate significant sections of that aircraft to improve the capabilities of their current Super Hornet fleet. The payment for this expansion will be amortised over the 15 year timeframe so yearly defence increases will be achievable. I believe the new defence white paper will outline how far above the old 2%GDP target the new target will be, but I would not be surprised if the new target is in the 2.3% to 2.5% GDP range. This equates to additional yearly defence spending of between $4.5 billion to $7.5billion (in current day dollars) once the new GDP target is reached. Obviously the new additional spending will take time to ramp up to that level and will not occur in year 1. Any thoughts? I think the days of ‘one-off, additional funding’ are long gone, yes back in the Howard Government days, there were overflowing buckets of money, but that’s all been spent. Today we have a very red hot glowing Government Credit Card!!! I think defence will be lucky if spending gets to 2% of GDP (and stays there) in the time frame this Government has stated, but as we know we have elections every three years and depending on what happens (maybe not the next, but the next election), we could have changes of Government and we could see defence being ‘robbed’ again. Believe me I’m all for a strong ‘balanced’ defence force, I’m all for as much money as possible being spent, but even in my wildest dreams I can’t see it getting to the 2.3-2.5% you are suggesting, we would have to be under some serious threat of something major happening for that to occur. Your suggestion of having that many combat aircraft is a nice thought, but, realistically I can’t ever see it happening. Bless you Austalia. Our greatest friend in an unfriendly world. Keep safe. Tail winds and clear skies. Stay well and kick’em in the goolies! I can’t help wondering why all the high-tech aircraft against such a low-tech enemy though. Sticking a JDAM or somesuch into an SUV with a machine gun mounted in it seems a tad overkillish to me. I would have thought something like, oh I don’t know, an A-10 Warthog using the appropriate weapons with a loiter/availability time superior to any of the High-Tech Whizz Bang Space toys. The ONLY downside I can see in this is the speed difference from go to on task. Should the situation change and the battlespace becomes (or looks like becoming) more dangerous with SAM’s, Fighters etc then, by all means, bring in the “good gear”. I also find it ironic that the RAAF’s Bomber/Strike Squadrons have a better Fighter than it’s Fighter Squadrons. The Knucks must be fuming — lol! New performance requirements for F 35. “In case of war, the A/C shall be towed to the runway and pointed in the general direction of the enemy”. Nuthin beats an A10 down low – especially that mighty cannon which actually slows the Aircraft when it fires… funny how the A1 Skyraider was so effective in Vietnam down low & slow over F4’s. Which is why they built the A10. F4 Phantom was built as a Multirole aircraft yet touted master of none… will F35 be the same. USAF is trying to hang onto their tough low cost yet highly effective A10 with advent of F35.